Since the 3-2 FA cup win over Hull City, I have been walking in cloud nine experiencing that feeling that have been absent since Vieira lifted the 2005 FA cup. I have been bullish with my Arsenal away jersey with SOCRATES boldly written on it with my favourite number 8. The season begin with a sour taste with a 3-1 one and only season home loss to Aston Villa. More worrisome was that our professor had made no signing save the untested Yaya Sanogo. With the pursuit for Suarez and Higuain futile, it was looking like the money will cool off in the banks. One more free signing in the form of returning french hatchet-man Flamini. Amidst the murmurs of signing a free man, Arsene Wenger broke the banks by getting German playmaker, Mesut Ozil from Real Madrid. The German raked in numerous assists during the course of the season with his superb passing. A big name player, a sign of things to come. The king of assists. Since losing on matchday 1, the gunners never looked back, breaking down oppositions, bringing down strongholds but Pundits still expressed their doubts. 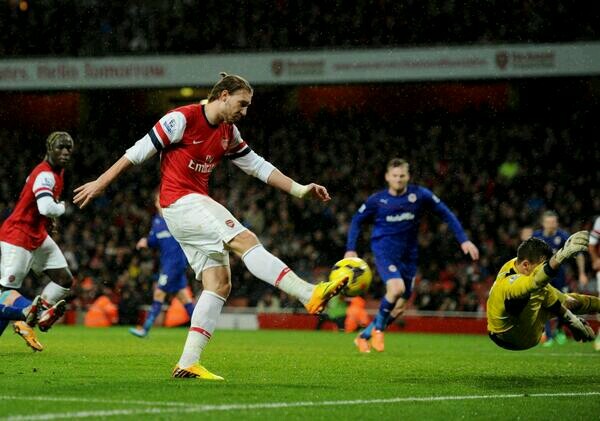 A headed goal from Santi Cazorla and a superb goal from Aaron Ramsey was enough to paint the Reds red. Now, they know the gunners are contenders. This was also a good outing for the defence as they shut the door on goal hungry Suarez and Sturridge. With the absence of Ozil and man-on-fire Ramsey, the gunners had to grind out a result on the 1st day of the year against Cardiff City. In the absence of Giroud, Podolski held forth but the man gooners love to say the negatives about provided the goods: Bendtner. The Dane reacted quickest to score Arsenal’s first goal in the 89th minute, justifying his status as the king of late goals, although injuring in the process. Walcott wrapped things up with a lovely chip to give the gunners 3pts. Happy New Year from Bendtner. Tomas Rosicky thunderous 2nd minute strike gave Arsenal 3 points over their North London neighbours, completing a hattrick of win over Spurs. 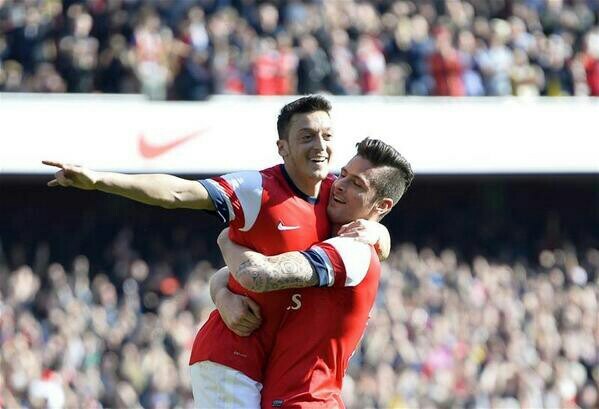 The gunners held on to their slim lead until the final whistle. A hattrick of clean sheets, a hattrick of wins over Spurs puts this amongst my highlights of the season. 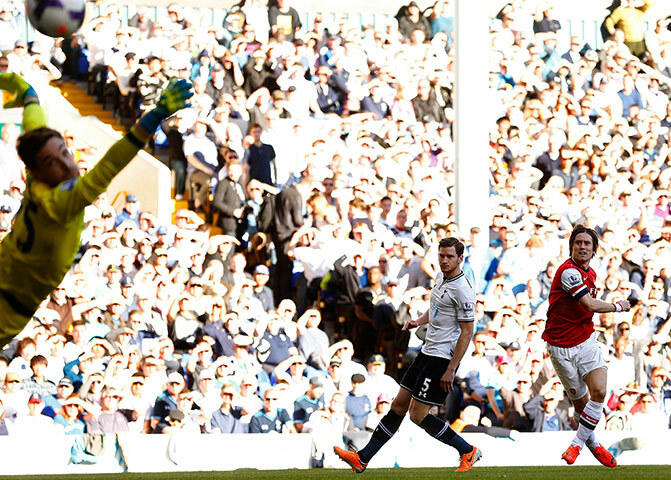 Tomas Rosicky, being my best gunner added icing with his goals against Spurs. Don’t forget Giroud’s flick-goal. Aaron Ramsey scored the winner in extra time as Arsenal came from two goals down to defeat Hull City to break their almost 9 years of no silverware. Any sort of trophy would do to open the Emirates account after so many years in the wilderness of trophylessness. 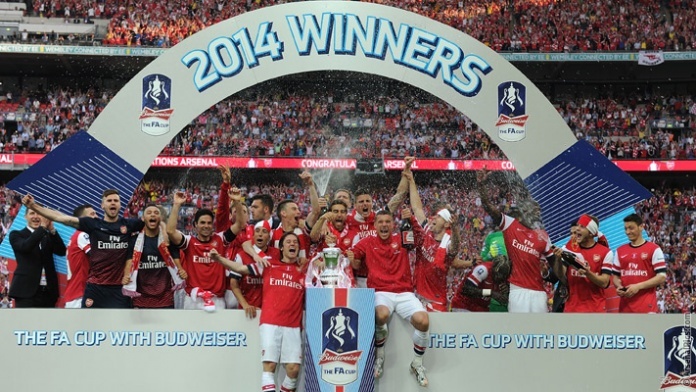 The Emirates FA cup would surely bring an avalanche of trophies next season. The FA cup, my best moment. Finally. What were your best 5 moments of the season? Comment. The voting sequence for the 2013/14 End of Season awards on goonerdaily is still ongoing, so feel free to make your votes count in the polls. For me the best season moment was winning The FA Cup. now we have to bring better players if we want to stay in the top four and compete for the title.